Charging while listening to music on your iPhone? Meet the new Duo 2 from Vinpok! Vinpok is known for its high-quality iPhone, iPad, and Mac accessories and well they created something new, the Duo 2. Ever since the iPhone 7 was released, people had to use an adapter to use their headphones. 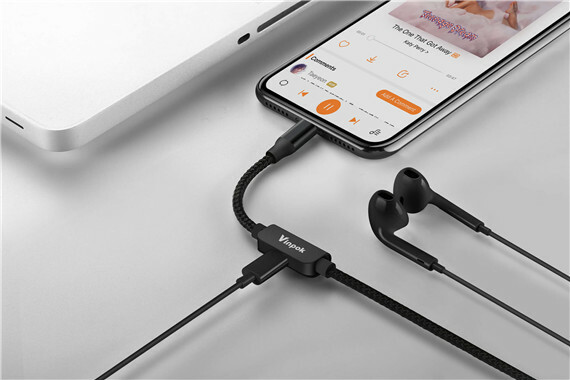 We kinda got used to it but still, it is a big hassle if the battery of your iPhone is almost dead and you still want to enjoy listening to your music with your headphones on. The Duo 2 should fix that problem. It’s not just your average charging cable that will break down after you use it too much. No, it’s a very reliable and sophisticated cable that also transmits audio. When we first saw the Duo 2 it was delivered in the case you see above. It’s a really nice case and it really comes in handy if you’re one of those people always losing your cables. The cable itself is so well designed that it fits perfectly in the case. You can even store some other cable in it too. It has so much space! The cable itself is covered in braided nylon fabric which makes it tangle-free and very durable. We twisted it around and around and it kept on working as it should be. Most of the cable nowadays are just plastic and will break after you use them too much. I can guarantee that this one doesn’t. Support Lightning EarPods as well as Charging. Support remote control and phone call. Adopt 24-bit, 48kHz audio transmission, Apple original sound quality. We tried it for a while and we totally loved it. It keeps fast charging and the audio doesn’t lose its quality. We all know that listening to music can surely drain your battery but if you’re using headphones you can’t charge it at the same time. The Duo 2 has fixed this problem! For more info, go to the website of Vinpok, sign up and have a chance to win one or get an exclusive discount!